Kick Axe will open a concert for Judas Priest at 8 p.m. Tuesday in Market Square Arena. It takes some bands years to become an overnight success. Kick Axe ought to know. Backed by eight years of hard work back home in Canada and a new album made with ace heavy metal producer Spencer Proffer, the band is making its first venture into America opening concerts for Judas Priest. "Yes, we're out promoting our new album, Vices," said bassist Victor Langen, calling recently from Cocoa Beach, Fla. "It's the perfect tour for us to be on since we'll be going all across the U.S."
Exposure is the name of the game for "new" bands, and it's one Kick Axe is quickly learning to play. 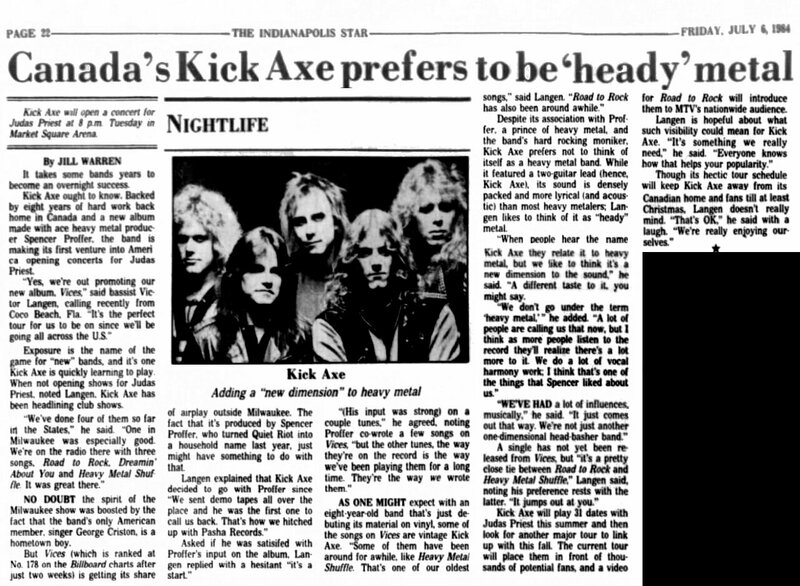 When not opening shows for Judas Priest, noted Langen, Kick Axe has been headlining club shows. "We've done four of them so far in the States," he said. "One in Milwaukee was especially good. We're on the radio there with three songs, Road to Rock, Dreamin' About You and Heavy Metal Shuffle. It was great there." NO DOUBT the spirit of the Milwaukee show was boosted by the fact that the band's only American member, singer George Criston, is a hometown boy. But Vices (which is ranked at No. 178 on the Billboard charts after just two weeks) is getting its share of airplay outside Milwaukee. The fact that it's produced by Spencer Proffer, who turned Quiet Riot into a household name last year, just might have something to do with that. Langen explained that Kick Axe decided to go with Proffer since "We sent demo tapes all over the place and he was the first one to call us back. That's how we hitched up with Pasha Records." Asked if he was satisfied with Proffer's input on the album, Langen replied with a hesitant "it's a start." "(His input was strong) on a couple tunes," he agreed, noting Proffer co-wrote a few songs on Vices, "but the other tunes, the way they're on the record is the way we've been playing them for a long time. They're the way we wrote them." AS ONE MIGHT expect with an eight year-old-band that's just debuting its material on vinyl, some of the songs on Vices are vintage Kick Axe. "Some of them have been around for awhile, like Heavy Metal Shuffle. That's one of our oldest songs," said Langen. "Road to Rock" has also been around awhile." Despite its association with Proffer, a prince of heavy metal, and the band's hard rocking moniker, Kick Axe prefers not to think of itself as a heavy metal band. While it featured a two-guitar lead (hence, Kick Axe), its sound is densely packed and more lyrical (and acoustic) than most heavy metalers; Langen likes to think of it as "heady" metal. "When people hear the name Kick Axe they relate it to heavy metal, but we like to think it's a new dimension to the sound," he said. "A different taste to it, you might say. "We don't go under the term 'heavy metal,' " he added. "A lot of people are calling us that now, but I think as more people listen to the record they'll realize there's a lot more to it. We do a lot of vocal harmony work; I think that's one of the things that Spencer liked about us." "WE'VE HAD a lot of influences, musically," he said. "It just comes out that way. We're not just another one-dimensional head-basher band." A single has not yet been released from Vices, but "it's a pretty close tie between Road to Rock and Heavy Metal Shuffle," Langen said, noting his preference rests with the latter. "It jumps out of you." Kick Axe will play 31 dates with Judas Priest this summer and then look for another major tour to link up with this fall. The current tour will place them in front of thousands potential fans, and a video for Road to Rock will introduce them to MTV's nationwide audience. Langen is hopeful about what such visibility could mean for Kick Axe. "It's something we really need," he said. "Everyone knows how that helps your popularity." Though its hectic tour schedule will keep Kick Axe away from its Canadian home and fans till at least Christmas, Langen doesn't really mind. "That's OK," he said with a laugh. "We're really enjoying ourselves."